Lotus Plants For Sale - Low Prices Online & Fast Ship! The pink lotus flower symbolizes wealth, grace, beauty, and serenity. 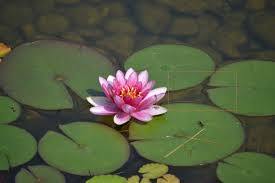 The pink lotus has loose leaves that are spaced apart to hold its resilience as it floats above water. The pink lotus is a beautiful flower that is pleasing to the eye, and the scent of tropical gardens are pleasant to the sense of smell. These water garden jewels are a sacred flower, and its cup-shaped pedals can range from pale to hot pink. The beauty of the Lotus flower and watching the petals bloom during the day and close at night will give a sense of serenity guaranteed to provide you with a sense of solitude when enjoying this plant. It can reach upon maturity up to 6 m depending on the deepness of the water in which it grows. In India, the rhizomes of this plant can be consumed in many different savory dishes. Leaves of this plant come circular and float upon the surface of the water and have long leaves stems that have little bumps all over them. One can eat the stems and the leaves which used as vegetables in India. The pink flowers are rosy pink or sometimes white and have lots of petals. These plants for the regions of Buddhist and also Hindu are sacred. Asian Art and literature often display this plant or flower. The blooms of this plant eaten in India as a vegetable. The seeds of the Lotus plant are very dark brown and hard. They are oval and also sometimes ingested in India. This plant can grow in areas that have flooded. It is a hardy plant and hard to eliminate once planted. This beautiful plant will have huge leaves that can be plate sized and multi-petaled. They will have a seed head that is ornamental and can be dried and used in flower arrangements. These are healthy plants and do well at home in a pond over winter. As it gets warmer, the lotus plant will emerge with new growth. If one plants them in containers, then one will need to plant them between 2 and 6 inches deep and then sink them into the water and make sure they are about 5 inches below the surface. These make lovely cut flowers, which are very fragrant and have beautiful foliage.